Who will run the hadron collider experiments of the future? What can they do to prepare for such a monumental task and what can they expect to find? You will find some of the future leaders preparing this summer at the 2006 Hadron Collider Physics Summer School, to be held at Fermilab August 9-18. The school is the first in a joint CERN-Fermilab series. It is aimed at advanced graduate students and recent PhDs. The school organizers recently announced the lineup of lecturers. Organizers designed the program to cover both theoretical and experimental subjects, with an eye on LHC physics in particular. "I think we should be as open-minded as possible to what the discovery likelihood of the LHC will be,"
says theorist Chris Hill, who will lecture on theoretical issues during the first years of the LHC. "There are many, many theories. Do any of them contain what's going to be discovered, and if so, which one? Frankly we just don't know." Hill suspects experimentalists will discover a whole new spectroscopy beyond the Standard Model that will reveal new symmetries or new dynamics in nature. get more accurate measurements. There [at the LHC], you're turning on a new energy regime," says Green, who will lecture on experimental issues during the first years of the LHC. "Something has to give on the Standard Model at TeV energy scales." The application deadline for the 2006 Hadron Collider Physics Summer School is April 8. If you would like to apply, visit the HCP Summer School Website. presented their ongoing work. The Work Breakdown Structure (WBS) provides templates to each GDE working group and helps them define their cost estimates. "The main issues of this group is to make sure that the final system will be consistent and acceptable for everyone," said Garbincius. You don't get much closer to the big bang than this. Scientists peering back to the oldest light in the universe have evidence to support the concept of inflation, which poses that the universe expanded many trillion times its size faster than a snap of the fingers at the outset of the big bang. Moth species outnumber butterfly species in the Order Lepidoptera by 10 to 1 according to some estimates, yet butterflies seem far more common. It may be because moths fly mostly at night, or because many of the specimens are so small, that the abundant moth population goes unnoticed. But cryogenics engineer and ELM committee chair Tom Peterson has noticed them. Peterson created The Moths of Fermilab Web page last month, after photographing moths onsite for a couple years. He also presented "Not Butterflies! - A look at some of the common, conspicuous, or day-flying moths and how they differ from butterflies" at a recent workshop for the Illinois Butterfly Monitoring Network, of which he is a member. "In a lot of ways, moths are more interesting than butterflies because of their diversity. There are a tremendous variety of sizes and life habits," says Peterson. On the new Web page, Peterson highlights some of the larger, more colorful, and day-flying moths around the lab. There are moths that look like bumblebees or hummingbirds and others that mimic wasps. 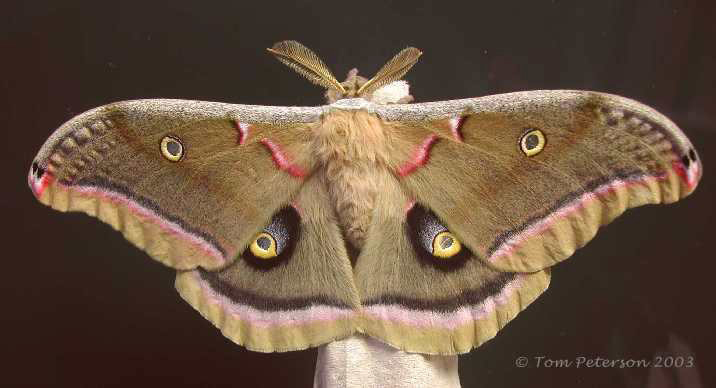 The usual way to distinguish a moth from a butterfly is to examine the antennae and body--butterflies have slender, clubbed antennae and slender bodies while moths often have "furry" or "stringy" antennae and furry bodies--although there are always exceptions, according to Peterson. Moths also tend to hold their wings open horizontally while at rest, while butterflies are more apt to hold theirs closed, or partly closed. Ross Doyle, Fermilab employee since 1972, is retiring from his job in the Accelerator Division. There will be a reitrement party for Ross (aka "The Red") on Friday, March 24 at Riverview banquets in Batavia. $15 includes the buffet, beverages and a portion of Ross's gift. If you would like to attend, please contact Ruth Becker by Monday, March 20. You can reach her at x4736. Murder Mystery Dinner Theater at the Milk Pail Restaurant & Entertainment Complex in East Dundee presents "Un-Luck of the Irish" on March 18 at 7:00 pm. A perfect way to celebrate St. Patty�s Day with friends...a murder mystery full o� fun! Reserve your seats today! Save $10.00 per Person. Ticket price includes dinner, show, tax and gratuity. Deadline to order tickets is noon on March 15. Order forms can be found in the Recreation Office or on the website. Hollywood Boulevard, Chicago area's first full-service, fully integrated restaurant, bar and movie theater is offering Fermi Night at the Movies on Wednesdays. Show your Fermilab ID and get one free admission per visit (an $8.00 value). Theater attendees must be 21 or older unless the show denotes that it is an all age matinee. The theater is located at 1001 W. 75th St at Lemont Rd. in Woodridge. For show times go to the website. For more information contact the Recreation Office, x2548 or x5427.